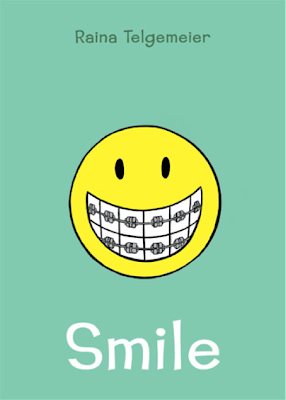 SMILE by Raina Telgemeier is perfect for any elementary-age classroom. Raina‘s narrative comic tells the story of how she knocked out her two front teeth in the sixth grade. Her memoir continues into high school as her dental issues pair simultaneously with puberty and growing up. Raina says, “Creating SMILE has been therapeutic for me, and has put me in touch with hundreds of kindred spirits.” This is why I love having this graphic novel as a part of my classroom library. Almost every student can relate to some aspect of this story, even if they haven’t had any traumatic injury. Her storytelling also lends it nicely with teaching students to monitor their reading comprehension by asking questions. By the end of the book, Raina emerges a stronger person. Students also emerge stronger readers as they interact with SMILE and learn to question the text, read to discover answers, and ask questions to expand their thinking. Although taking place in middle school and high school, SMILE’s fifth grade following stems from Raina’s artwork. In 2004, Raina published SMILE as a weekly webcomic for the popular site, Girlamatic.com. I believe this has influenced how she breaks up her story page-by-page, but also how she uses color. Her artwork has the feel of reading the Sunday comics, but with more mature character development. She captures each character’s personality and does an amazing job illustrating adolescent. Raina also uses splash pages, a comic page that is almost entirely taken up by a single image or panel, to either emphasize important parts to the story, or as chapter breaks. For example, on page 11, after knocking out her front teeth, Raina’s mother has to dial the dentist. All you see is her mother dialing with her phone book open to an after-hours dentist. It fits perfectly, especially after the quick pace of the previous accident. The reader needs to slow down in order to fully understand the seriousness of what just happened. SMILE is a great memoir, told in a wonderful narrative fashion. I use SMILE as an anchor text to teach questioning. Asking questions while reading, although a seemingly simple task often gets overlooked in reading instruction. Or, if it is a focus, the questions tend to be surface (or thin) questions that do not lead the reader to discover new information or gain new knowledge. 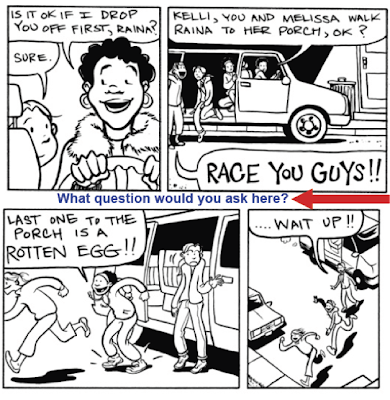 Good questioning propels readers through a particular text. When readers think about questions, they understand what they read and it pushes them to think further. 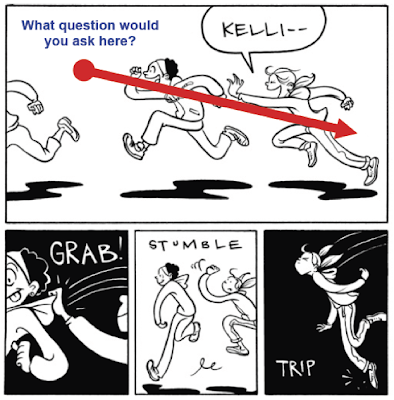 I want to teach students to pose questions that extend their understanding, making them active readers. SMILE is a great text for this task. 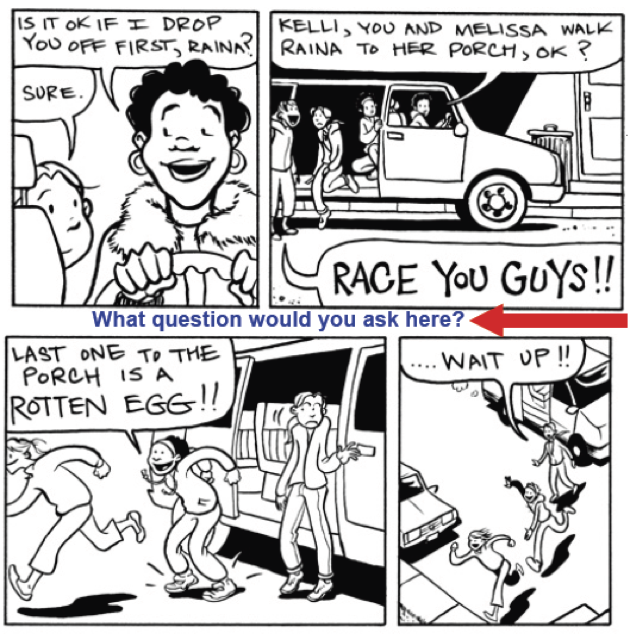 Raina’s use of panel and page breaks gives readers ample opportunities to monitor their comprehension by asking questions. If a teacher wants to introduce this concept, he/she could simply have SMILE displayed using a document camera, or even as a read aloud, while the teacher models stopping, thinking, and reacting to the text. When a reader has a question during reading, I have them jot it down on a sticky note. These questions may or may not be answered by continued reading; however, it is a good habit to form. I want to model being aware when I do find an answer to one of my questions. I usually have students mark their original sticky note with an “A” to indicate that the question has been answered. As Raina suffers through each dentist examination, there are many opportunities for students to not only ask questions to gain information, but to keep their questions in their mind as they read, searching for information that extends their learning. Drilling a hole in your tooth to the root canal. Removes infection and patches it up. Do they ever get a second opinion? Why does Raina dream of losing a tooth? She is getting her teeth pulled. It is another traumatic event. Why is smiling so important in middle school? Middle school is a very social place. Used clues from the text and our thinking to infer. SMILE gives students a chance to ask bigger questions that expand their thinking. My class learned so much about dentistry, root canals, and dentures! Throughout SMILE, students sometimes become confused about some of these more complicated ideas in the story (i.e. root canals and middle school cliques). Stopping and asking these questions leads to more thoughtful learning and further research. 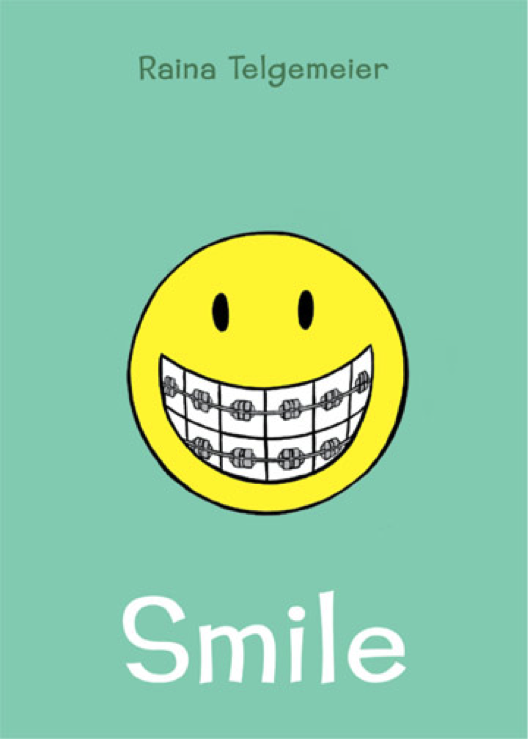 Finally, Raina Telgemeier put out a great book trailer for SMILE. I love book trailers as a way to insert a little technology to spruce up any final novel study project. There is nothing inappropriate about SMILE. This story, although dealing with adolescent, does so with tact and humor. You may get some giggles when Raina plays “spin the bottle” or daydreams about kissing a boy, but that’s about it. In my experience, students are so excited to be reading a graphic novel in “Reading class” that it makes those little things non-issues. I would highly recommend this book for any upper elementary and middle school classroom (grades 3-8). Although not all third-graders will be able to decode the entire text, and some eighth-graders will find SMILE too elementary, either way, it is a great addition to any classroom library.